Queen Anne’s Lace recalls the simple charm of a photogram, an early photographic process where objects, frequently botanical specimens, were placed directly on a photosensitive paper and exposed to sunlight. In fact, the detail captured in this floral design was probably created by placing the flowers directly on the photographic emulsion used to create the silk screens. But the printing process is layered and complex. The fabric was created by House of T Fabrics, the workshop of husband-and-wife designers Doris Doctorow (D.D.) and Leslie Tillett. Leslie was a fourth-generation textile printer, and learned the craft from his father, George Tillett. One of George’s innovations was the drag box, a tool which had a box to contain the printing ink, with a narrow slit at one end to allow the ink to be deposited on the fabric. The brilliant red background of Queen Anne’s Lace is entirely hand-applied with the drag box. By slightly overlapping each band of color, irregular pinstripes of darker red are created. 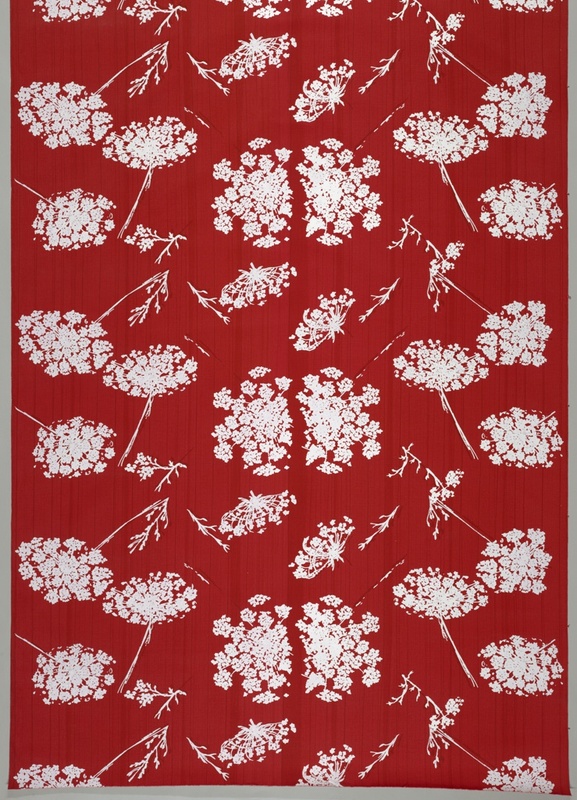 The flowers are screen-printed in opaque white pigment, while a second screen of just the stems and leaves is printed in red, creating a shadow effect. Layers of detail such as these, made possible by their intensive hand-production techniques, made the Tilletts favorites of interior designers. ← Can It Be Cubist?